Rare aluminium twin screw fishing vessel in AMSA 3C survey. Launched in 2013 this Schwetz designed John Cole built Ali fishing vessel presents in as new condition. Recently lengthened from 10m to 12m by Wake Maker Marine in Henderson, this vessel now carries 40 cray pots with ease. Recent engine upgrade to twin Evinrude 300HP outboards gives an impressive sprint speed of 40 knots and economical cruise speed of 26 knots. Amazing fuel efficiency with the 30%-40% less consumption than when the vessel was 10m and previously powered. 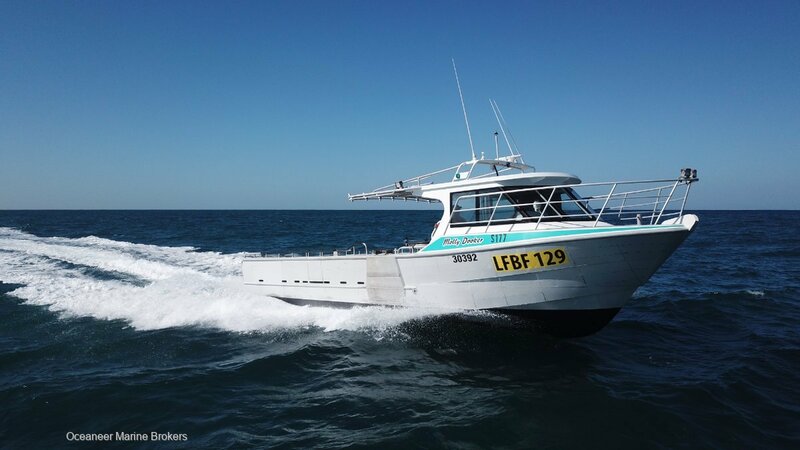 Vessel is currently set up for Rock Lobster Fishing operations with impressive live tank capacity holding 8 prawn baskets below deck aft, 6 able to be plumbed in forward and 2 in the day tank. Live tank pumps are near new! Vessel is fitted with electro hydraulic winch and a hydraulic deck hose that works independently of the main engines through a 9KWH battery pack. A large lithium battery powers electrical systems, radios and navigation systems for up to 24 hours without running the engines. Extremely safe vessel overall with great stability, but is also filled with floatation so no life raft required! Well worth investigating for charter operations or make it your recreational fishing machine for Rottnest, Abrolhos Islands, Exmouth and beyond. Please call Oceaneer Marine Brokers for full inventory and details.